The population of Western Pond Turtles has grown in the Columbia River Gorge, thanks to the Western Pond Turtle Recovery Project. The program started in the early 1990's when there were less than 100 Western Pond Turtles in Washington, according to the Oregon Zoo. According to a district wildlife biologist at the Washington Department of Fish and Wildlife, there are now as may as 800 turtles in four different populations in the Columbia River Gorge. 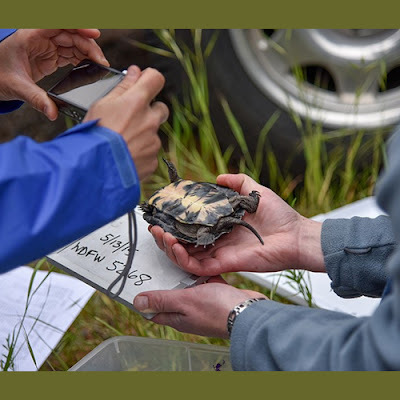 Learn why the Western Pond Turtle Recovery Project in the Columbia River Gorge has not declared victory yet by reading more about the turtle's hurtles below. Almost 25 years in, the Western Pond Turtle Recovery Project has been a success by most accounts. But is there an end point? Can the effort ever declare victory? "With any species recovery program, the goal is a self-sustaining animal population without human intervention," Cutting said. Western pond turtles in the Gorge aren't there yet, Anderson said. One target is having four separate populations of at least 200 animals, he said. The four current populations — three in Skamania County, one in Klickitat County — haven't reached that level yet. And there are other considerations than just numbers, Anderson said. "We want to have an evenly distributed number of younger and older turtles in the population," Anderson said. The program has helped the species rebound in the region by plucking hatchling turtles from the wild, then raising them for 11 months in the safe confines of captivity. With controlled summer-like conditions year-round, the animals feed and grow faster than they normally would. When the juvenile turtles are large enough to fend for themselves, they're released back into the wild. The Oregon Zoo and Woodland Park Zoo take the role of raising the animals while they're in captivity. The task of monitoring and tracking the turtles falls to WDFW, Anderson said. The turtles' survival rates have been very high after release, according to the Oregon Zoo. But some mortality is inevitable. Among the biggest threats to the turtles are predators like bullfrogs and loss of habitat — likely the main reasons their numbers declined in the first place, U.S. Forest Service spokesman Leanne Veldhuis said in an email. The turtles have also had to cope with disease, Anderson said. WDFW officials earlier this month trapped and evaluated some turtles affected by a disease that creates small lesions on the shell, he said. WDFW also conducts periodic population estimates as part of its monitoring efforts, Anderson said. Turtles are often marked so they can be identified and observed at later visits. If the population were declared healthy, officials would go through a de-listing process to remove the western pond turtle as a threatened species.